EK releases new DBAY D5 MX reservoirs and reservoir / pump combos! EK Water Blocks, Ljubljana based premium liquid cooling gear manufacturer, is proud to release the MX series of Dual Bay reservoirs. 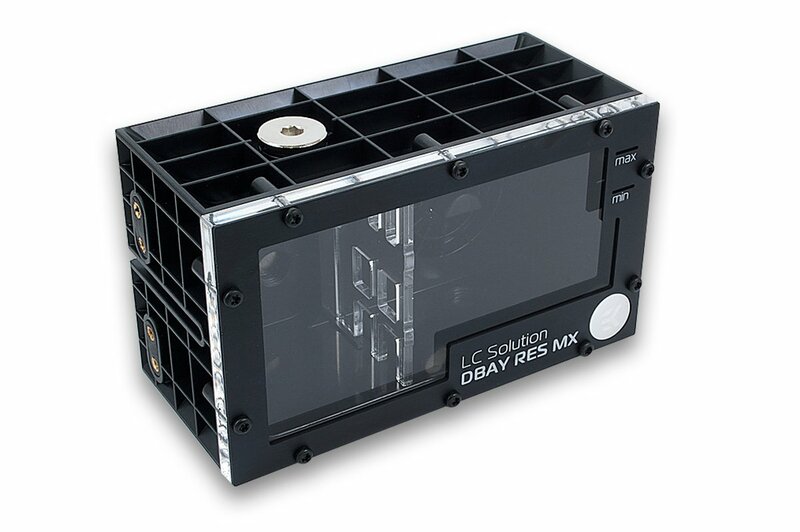 MX series brings four new products to the EK liquid cooling portfolio and has been designed to lower the production costs of the existing EK-DBAY D5 reservoir yet still offer a convenient solution as a two-slot 5.25″ drive bay form factor reservoir. 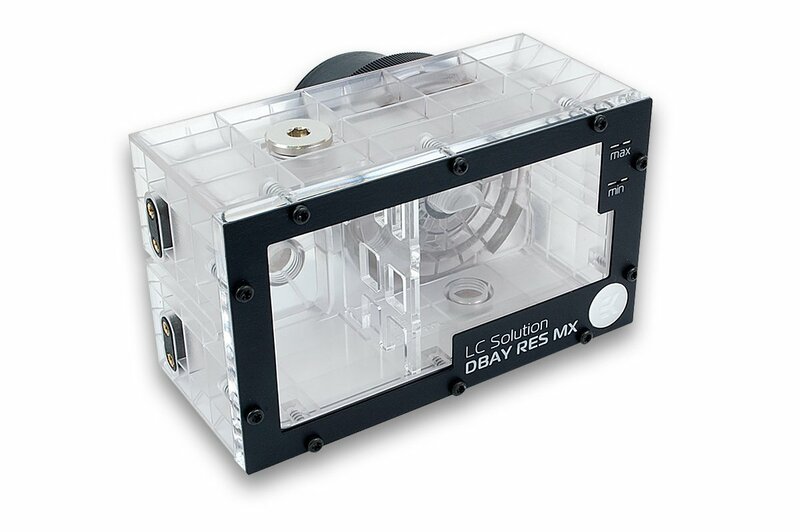 EK-DBAY D5 PWM MX is a reduced cost variant of EK-DBAY D5 high-performance hydraulically improved pump top (volute) with a two-slot 5.25″ drive bay form factor reservoir and integrated Laing D5 PWM water pump. PWM control allows for automatic pump speed regulation depending on your CPU temperature. Full performance on demand or whisper quiet operation in idle mode! Backside where the pump is mounted. 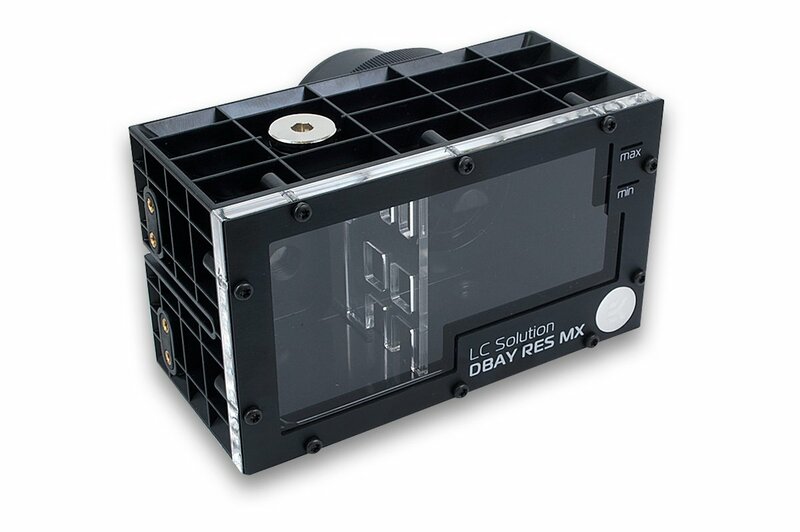 The EK-DBAY D5 MX series reservoirs are designed for two 5.25″ drive bay slots in order to provide more room for other components when facing limited space constraints. Made from injection molded black ABS polymer (Acetal version) or injection molded transparent MABS polymer (Plexi version), this sturdy, monoblock design guarantees maximum reliability and rigidity! 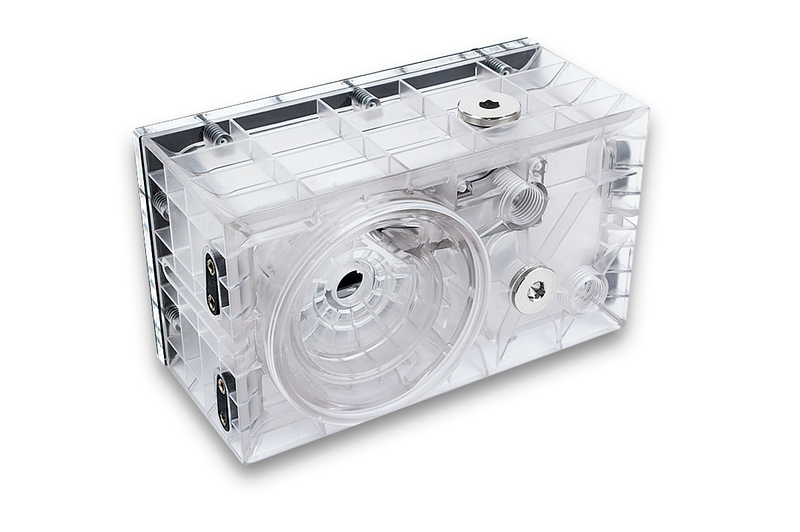 Back side of the unit features a mounting space for the EK-D5 PWM pump motor (can be purchased separately or as a combo). Locking ring nut and O-rings for the pump (if installed), made from black anodized CNC machined aluminum, are enclosed. 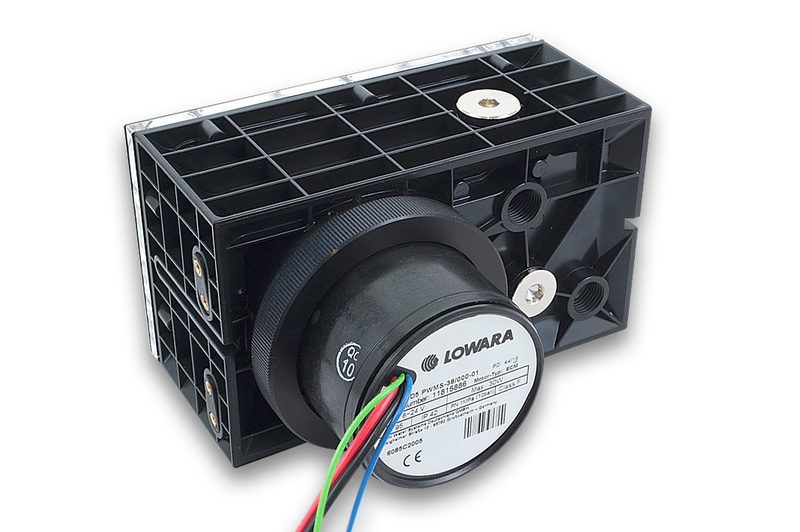 EK-DBAY D5 MX can be upgraded with EK-D5 PWM Pump Motor. 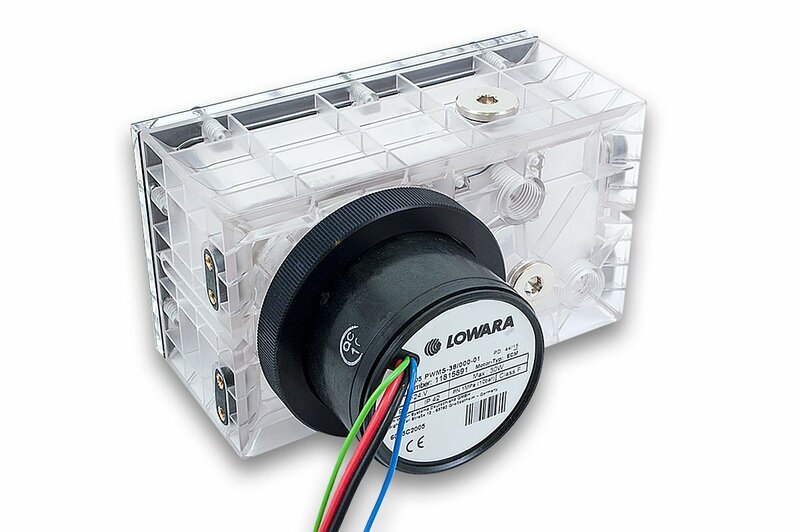 All four variations can be used as a standalone reservoir unit only and feature one G3/8″ threaded port on the top of the reservoir which serves as a fill port for the system. Other ports are standard G1/4″ threaded – three on the backside of the unit to be used as inlet and outlet ports and one on the bottom that can be used as a drain port – and allow for installation of virtually any G1/4″ threaded fitting / barb. Integrated anti-cyclone is pre-installed and made from acrylic glass effectively prevents excessive vortex formation of the liquid. 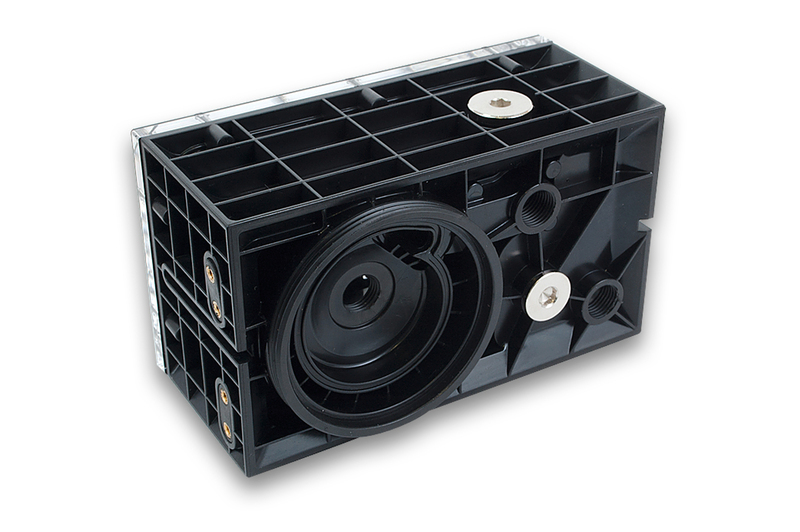 EK-DBAY D5 MX series is designed with anti-vibration rubber mounting system. This floating design effectively silences this pump / reservoir setup by de-coupling it from the rest of the computer chassis. EK-DBAY D5 MX and EK-DBAY D5 PWM MX with included pump are made in Slovenia, Europe, while the pump motor is made in Hungary. This product is readily available for purchase through EK Webshop and Partner Reseller Network. In the table below you can find MSR prices with VAT included.